2017 was not a stellar reading year in several ways but it was not terribly disappointing either. For one, I was disappointed that I did not read any more print books than I did. But the up-side is, if I read less, it is because I am working more. My days have been Full - every day that it is not raining. And we have had little rain this year. I've held the paintbrush, the sander, the chainsaw, the rake, the shovel, the loppers, and the mower for many more hours than I've held a book this year. So lots has gotten done and less has gotten read. Much of the working hours were accompanied by an audiobook, and many of these were such disappointments that they were abandoned. I devoted 2017 to read more about Alaska, another new fascination. If I let myself, I would binge-read all-things Alaska. But I'm like a book-hoarder, afraid of running out, so I spread those out. I plan to continue my Alaska-fest throughout 2018 also. 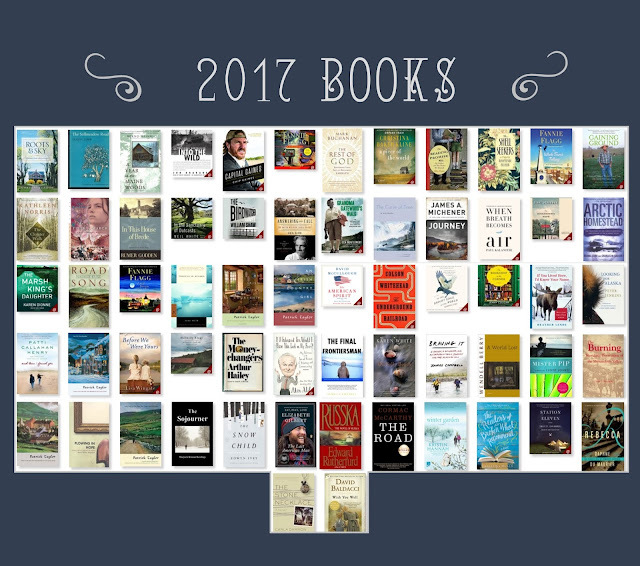 Below are 2017 Alaska-related books. The capstone book of this Alaskan fascination was James Michener's Alaska. After reading Michener's memoir The World is My Home, I didn't trust that I would be able to deal with his Alaska. The memoir was --to me-- just so egotistical. But there is a reason Michener's historical fictions have always been bestsellers - he can write a great story of epic proportions. I've even added some more of his books to my to-read list. A new favorite series I've found (and have rationed these too) is Patrick Taylor's Irish Country Doctor series. The reading is easy and delightful, reminiscent of James Herriot's All Creatures books. Fannie Flagg has accompanied me through many outdoor tasks and delighted me on audio, especially when she narrates. I've several more for 2018.